(1) Department of Neurosurgery, Hospital General Universitario de Alicante. Alicante, Spain. (2) Laboratory of Neuroanatomy, Universidad Miguel Hernández de Alicante. Alicante, Spain. In the past, operative access to the fourth ventricle was obtained by splitting the cerebellar vermis or removing part of a cerebellar hemisphere. We also found that opening the tela alone will provide adequate ventricular exposure, in most cases, without splitting the vermis. The inferior medullary velum can also be opened if opening the tela does not provide adequate exposure. Opening the tela alone provides access to the full length of the floor and the entire ventricular cavity except, possibly, the fastigium, superolateral recess, and the superior half of the roof. Opening the inferior medullary velum accesses the latter areas, including the superior half of the roof. 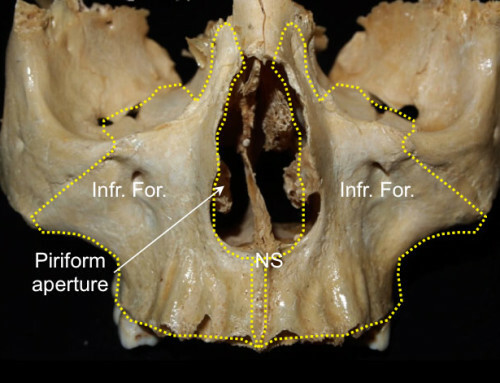 Extending the opening in the tela laterally toward the foramen of Luschka opens the lateral recess and exposes the surfaces of the cerebellar peduncles bordering the recess. 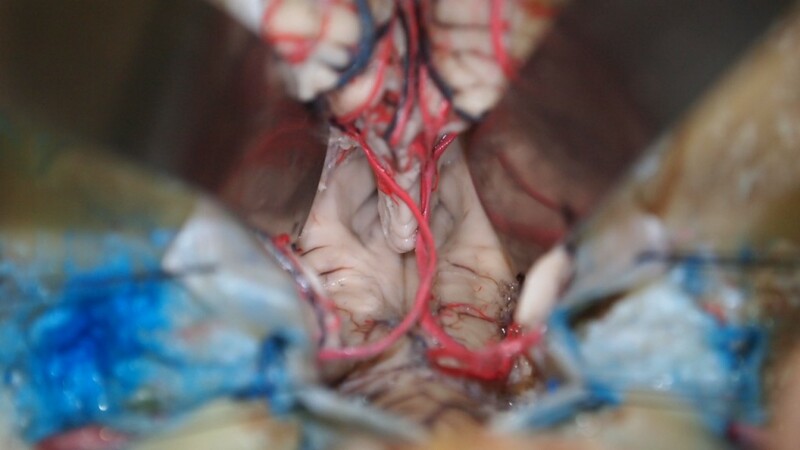 Tumors in the fourth ventricle may stretch and thin these two semitranslucent membranes to a degree that one may not be aware that they are being opened in exposing a fourth ventricular tumor. The operation can be performed in the prone or the sitting position. In the prone position, there is a greater tendency for venous hemorrhages to occur; in the sitting position, there is a greater risk of air embolism. The incision is made in the midline; beginning 2 to 3 cm above the external occipital protuberance, it extends as far as C3 or C4. The fascia and the musculature are divided in the midline (nucal ligament-marked with the discontinuous red line) and retracted laterally. A muscle stump is left in place al the superior nuchal line. This facilitates approximation of the musculature during wound closure. Bleeding from the bone is controlled with bone wax. EOP: external occipital protuberance; Oa: occipital artery; SCM: sternocleidomastoideus; SemC: semiespinalis capitis. EOP: external occipital protuberance; NL: nuchal ligament; Oa: occipital artery; On: occipital nerve; SCM: sternocleidomastoideus; SemC: semiespinalis capitis. *: Asterion. 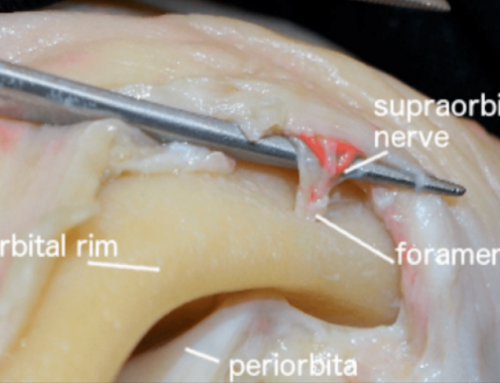 After the underlying muscles have been stripped away in a subperiosteal fashion, the suboccipital bone, the upper cervical lamina and the spinous processes of C2 are exposed. EOC: external occipital crest; EOP: external occipital protuberance; INL: inferior nuchal line; n: nerve; SNL: superior nuchal line; VA: vertebral artery. One burr hole each is placed in paramedian position in the occipital squama over the cerebellar hemispheres. Occasionally, the dura over the cerebellar hemispheres is very thin and fragile; this requires careful attention during the osleoclastic craniectomy. Using the drill or forceps of all kinds (curved, angulated, straight, etc. 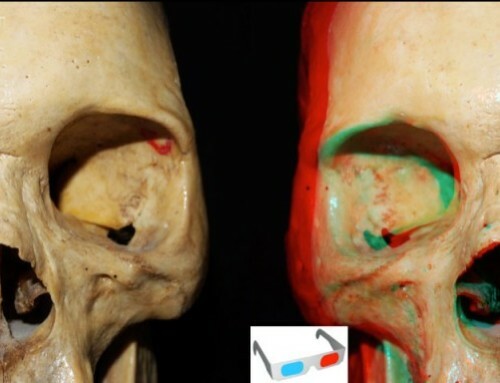 ), the bone is bilaterally removed down to the transverse sinus. In the presence of very strong occipital squamae, particularly in the confluence area, the bone can be thinned with burrs. The transverse sinus has to be exposed as far as its inferior border, as there would otherwise not be sufficient visualization or space for an operative procedure in the depth. A partial resection of the atlantal arch has to be carried out. It should be borne in mind that the vertebral arteries enter the area of the great foramen at the superior border of the lateral atlantal arch. dr: dorsal ramus; n: nerve; OC: occipital condyle; VA: vertebral artery; vr: ventral ramus. As a general rule, the dura over the midline of the posterior cranial fossa is opened by a Y-shaped incision, the two arms extending to the transverse sinus, and the vertical leg of the Y heading in the cervical direction. 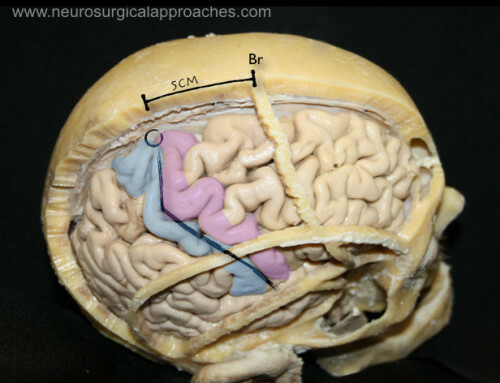 The dura should always be opened as far as Cl – C2 to allow easy inspection of the cerebellar tonsillae. The occipital sinus, which develops with considerable variations, requires a double ligature in all cases. n: nerve; OS: occipital sinus; VA: vertebral artery; Yellow line: Y-shaped durotomy. Not uncommonly, the arachnoid is left in place and has to be opened with a sharp hook draining CSF. 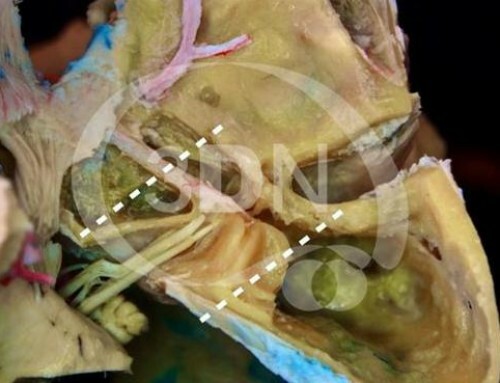 After the Y-shaped opening of the dura and retraction of the arachnoid the cerebellar hemispheres, the vermis and tonsils are exposed, with the vessels coursing superiorly. bvl: biventral lobule; cmf: cerebellomedullary fissure Ivv: inferior vermian vein; pci: posterior cerebellar incisura; T: tonsil; V: vallecula; M: medulla. Both tonsils have been retracted laterally to expose the medial portion of the cerebellomedullary fissure. pica: posterior inferior cerebellar artery; T: tonsil; U: uvula. The tonsils may be carefully retracted laterally with self-retaining retractors, taking care not to injure or compress PICA. P: pyramid; pica: posterior inferior cerebellar artery; U: uvula; tc: tela choroidea. Imv: inferior medullary velum; tc: tela choroidea; U: uvula. PICA’s segments and branches: chb: choroidal branches to the tela choroidea; mtcs: medial trunk of the cortical segment (fifth segment); tm: tonsilo-medullary segment (caudal loop or third segment); tvt: telovelo-tonsilar segment (craneal loop or forth segment). Both tonsils need to be lifted out of the cerebellomedullary fissure to expose the caudal surface of the inferior medullary velum and the tela choroidea that form the lower half of the ventricular roof. The picture shows the relationships of the lateral margin of the cerebellar tonsil to the biventral lobule. The peduncle of the tonsil is the bundle of white matter, located at the superolateral margin of the tonsil, that attaches the tonsil to the remainder of the cerebellum. All of the margins of the tonsil, other than the site of the tonsilar peduncle, are free margins. The left tonsil has been retracted medially to open the deep cleft between the tonsil and the biventral lobule. The peduncle of the tonsil is at the superolateral margin of the tonsillobiventral fissure. bvl: biventral lobule; T: tonsil. Both tonsils have been removed to expose better the inferior medullary velum and tela choroidea. Both PICAs are exposed in their route trough the cerebellomedullary fissure. The inferior medullary velum and tela choroidea form the lower half of the ventricular roof. The nodule of the vermis, on which the inferior medullary arises, is hidden deep to the uvula. Fm: Foramen of Magendie; imv: inverior medullary velum; icp: inferior cerebellar peduncle; pica: both posterior inferior cerebellar arteries (third and forth segments) tc: tela choroidea; tvj: telovelar junction ( yellow discontinous line). The tela, in which the choroid plexus arises, has been partially removed on the right side at the telovelar junction. A dissector has been placed inside the superolateral recess to show the paper-thin inferior medullary velum. Opening the velum will expose the superolateral recess and the superior cerebellar peduncle. Imv: inferior medullary velum; tc: tela choroidea; tvj: telovelar junction. The choroid plexus is composed of paired L-shaped fringes, which have medial and lateral segments. Both inferior medullary vela have been divided to expose the superolateral recess and the ventricular surface formed by the superior and inferior peduncles; cp: choroidal plexus; icp: inferior cerebellar peduncle; lr: lateral recess; scp: superior cerebellar peduncle; slr: superolateral recess. The superior cerebellar peduncle forms the lateral wall of the upper half of the ventricle. The inferior cerebellar peduncle forms the anterior and upper margin of the lateral recess. The middle cerebellar peduncle, which forms a large prominence on the lateral surface of the pons, is separated from the ventricular surface by the superior and inferior cerebellar peduncles. Ap: area postrema; icp: inferior cerebellar peduncle; lr: lateral recess; ms: median sulcus; scp: superior cerebellar peduncle; sf: superior fovea; sm: stria medullaris. The vermis doesn’t need to be resected to see the anterior half of the ventricle. In surgery a gentle retraction of the uvula is enough to see the acueduct. However, in the present specimen, we have removed it to improve the anatomical exposition. Floor of the IV ventricle: fc: facial colliculus; ht: hypoglossal triangle; if: inferior fovea; me: median eminence; ms: median sulcus; o: obex; sf: superior fovea; sl: sulcus limitans; sm: striae medullaris; vt: vagal triangle. Anterior half of the IV ventricle: A: acueduct; lc: locus coeruleus; ms: median sulcus; smv: superior medullary velum; scp: superior cerebellar peduncle. Laboratory assistant: Sanchez de la Blanca Mesas A. 1-Fossett DT, Caputy AJ. Midline and paramedian suboccipital approaches. Felicity Edge, editor. Operative neurosurgical anatomy. 1st ed. New York: Thieme; 2002. p. 86-89. 3-Mussi AC, Rhoton AL Jr. Telovelar approach to the fourth ventricle: microsurgical anatomy. J Neurosurg. 2000 May;92(5):812-23. 4-Rhoton AL jr: Cerebellum and fourth ventricle. Neurosurgery 47 [Suppl 3]: S7-27, 2000. 5-Sekhar LN, Fessler RG. Supracerebellar Approach to the Pineal Region Lesions. Timothy Hiscock, editor. Atlas of Neurosurgical Techniques: Brain. 1st ed. New York: Thieme; 2006. p. 549-555. 6-Tanriover N, Ulm AJ, Rhoton AL Jr, Yasuda A. Comparison of the transvermian and telovelar approaches to the fourth ventricle.J Neurosurg. 2004 Sep;101(3):484-98.